Last Saturday I had the opportunity to work at Taste Washington, the Washington wine industry’s premier wine tasting event. I had contacted a couple friends in the industry to see if I could trade my time for entry into the $125 event. A friend hooked me up with one of the owners and winemaker of Cascade Cliffs Vineyard and Winery, Bob Lorkowski. This was a winery I knew nothing about. This was actually a good reset for me as I tend to think that I am familiar with most of the wineries in the state. Now how silly is that? The current number of winemakers in Washington is over 400 and continues to grow. We are the second largest producer of the states; we have nine major appellations; and produce over 20 varietals. 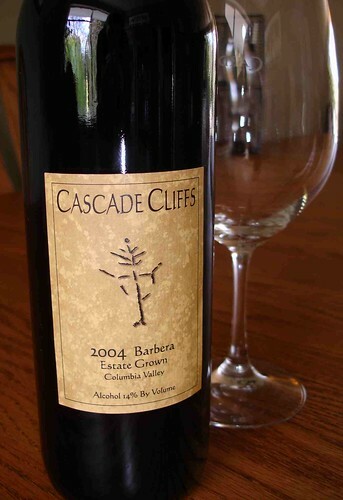 Cascade Cliffs is one of the producers helping expand that number of varietals with their focus on Barbera and Nebbiolo. Barbera is grown in very few places outside of Italy – mainly because, according to some sources, the Italians have been holding on to it pretty tightly. There is also relatively low demand for it outside of Italy. California has a few producers and the grape seems to have found a home in Argentina. Within Washington there are only a few producers, including David Lake who has been experimenting with the grape. When I got to my station last Saturday, I set up the table opened a bottle and took my inaugural sip of the wine I’d be pouring and talking about the rest of the day. It was their 2004 Estate Grown Barbera. It caught me a bit by surprise with its high acidity, low tannins and big fruit. I liked it. I wished someone would deliver a pizza or a big bowl of pasta and red sauce! Yet, after my second and third sip I liked this wine on its own. I won’t provide actual tasting notes since I spent the rest of the day (5+ hours!) stealing sips of this and other wines in between my pouring duties. I will tell you that I will be looking for this wine from now on. With a limited production of around 200 cases, I’m most likely to find it at the winery or in restaurants. The same for Cascade Cliff’s Nebbiolo which we technically weren’t pouring but had a few bottles stashed to share tastes with "special" tasters – basically the trade. You may be more familiar with Nebbiolo if I tell you it is the grape of Barolo and Barbaresco. These wines are much more famous than their cousin Barbera, yet in Piedmont Barbera production is about ten times greater than Nebbiolo – marketing! This winery also produces a blend that is more readily available at wine shops and grocery stores. It is called Goat Head Red and is a blend of Merlot, Pinot Noir, Cabernet, Nebbiolo, Zinfandel and Barbera. It was named after a goat that used to wander the cliffs above the vineyard. I haven’t tasted it but it has been described as a lighter, less serious wine – don’t take less serious as meaning lower quality, just a wine that can be enjoyed without examining its characteristics. I encourage you to look for and check out the wines from Cascade Cliffs. After tasting the wine and spending several hours with the winemaker, I am sure we will continue to see good things come out of this winery. Located in the Columbia Gorge in Washington but just across the river from The Dalles, Oregon it would make a fun road trip this summer. Especially since the number of wineries in that area has been steadily increasing.